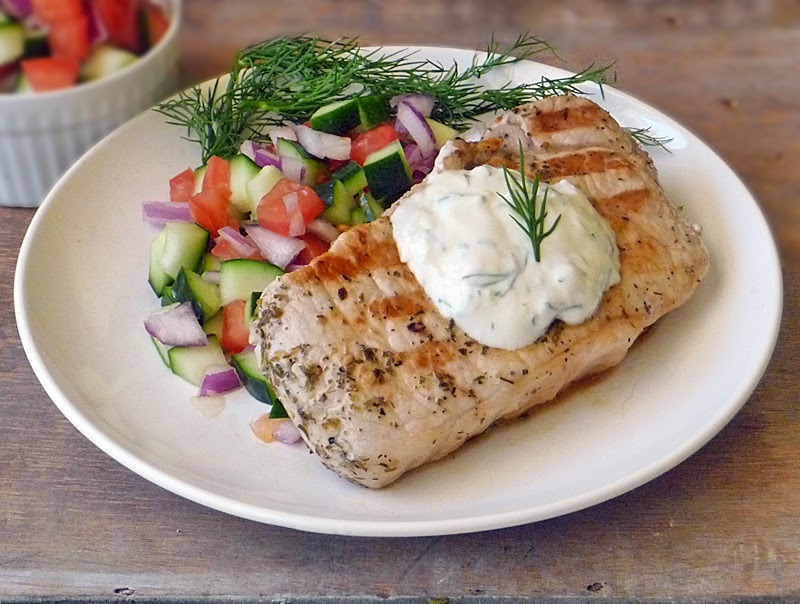 Greek Style Pork Chops with a Cucumber and Tomato Salad is a low carb, healthy meal full of flavor! My body responds better when I eat a low carb diet full of protein and vegetables. I have tried all sorts of diets over the years, and have always felt my best when limiting carbohydrates. I'm always on the hunt for new low carb ideas, and when I stumbled upon this Greek Style Pork Chop, I knew I had to try it! I love this recipe because it is easy to make, quick, and loaded with fresh ingredients which means lots of flavor! Also, pork is probably my favorite protein. I've never liked picking favorites, so I'll say "probably" to avoid committing. Don't ask me to pick a favorite movie, song, book, etc... There are just too many good choices to nail it down to one! Combine 1 tablespoon red wine vinegar, 1 teaspoon dried oregano, 1 teaspoon olive oil, and 1 teaspoon freshly minced garlic in a zip-top plastic bag or other container designed to marinate the pork chops. Add pork to bag, and seal. Marinate for at least 20 minutes at room temperature, turning after 10 minutes. 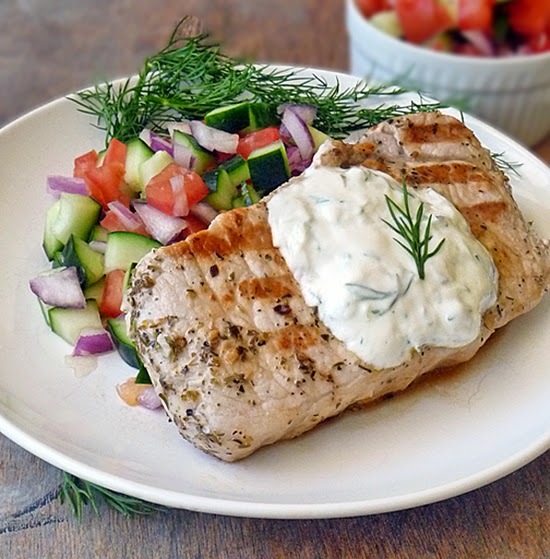 Combine remaining 1 tablespoon vinegar, 1 teaspoon olive oil, 6 ounces yogurt, 1 tablespoon dill, 1 tablespoon shredded cucumber, 1/2 teaspoon freshly minced garlic, a little bit of lemon juice and 1/8 teaspoon salt, stirring well with a whisk to make the Tzatziki Sauce. Give it a taste and adjust the flavors as needed. Cover and chill. Combine 1 1/2 cups diced tomatoes, 1 cup diced cucumber, and 1/2 cup diced red onion. Sprinkle tomato mixture with 1/8 teaspoon salt; toss to combine. Heat a Grill Pan over mid-high heat (375 degrees F). Coat pan with cooking spray. Remove pork from bag, and discard marinade. Sprinkle both sides of pork evenly with remaining 1/4 teaspoon salt. Add pork to pan, and cook for 3-4 minutes on each side or until instant read thermometer registers 140 degrees F. Remove pork from pan, and let stand for 5-10 minutes. Enjoy with the cucumber and tomato salad and a generous helping of the Tzatziki sauce! Perfect! I'm always looking for new pork chop recipes because they're so cheap and I get so tired of the plane old pork chop. Thank you! I'll try the recipe. Sometimes it is hard to find a good recipe for pork . Thanks! I agree! Pork is my fave, but it can be tricky! I hope you like it! Thanks for stopping by Lyubomira! Have a super week! I am trying this very soon. I hope you love them as much as we do, Rachel! This is definitely something light I like to make to off set the holiday indulgences!! Thanks so much for stopping by! Nicole, I don't have nutrition info on my recipes. If you google nutrition calculator you can enter the ingredients, in many cases even specific brands, and get a somewhat accurate count. There are minimal carbs in the main ingredients (the pork & vegetables). 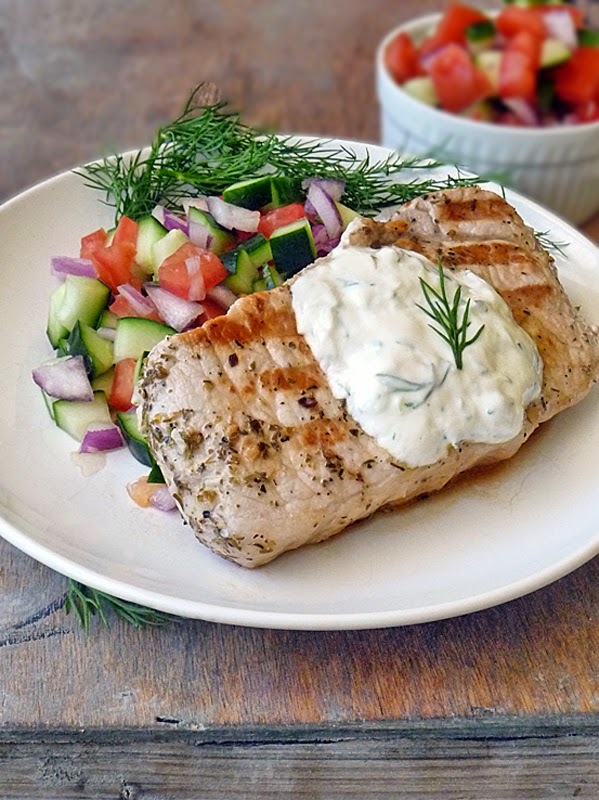 If using the Tzatziki sauce, the carbs will vary depending on the brand of yogurt you use. 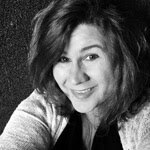 Nicole, here's the nutritional information from Yummly: 350 Calories, SODIUM 35% DV 830mg, FAT 20% DV 13g, PROTEIN 98%, DV 50g, CARBS 3% DV 9g, FIBER 4% DV 1g. Help! Looks good, but how do I print it? Very, very good! As it happens, I had everything for this recipe except the pork, which we do not eat. I used chicken breast, which I cut into half-inch slices, and they were delicious. I think I'll increase the amount of marinade next time, as the amount given was a little sparse; that may have been because of some difference in the "absorption rate" of the chicken as opposed to the pork. As I said, this was delicious, and The Squire has asked for it again.